This globally sourced and thoughtfully grouped trio of stones inspires a calm state of mind. Let this set of three naturally beautiful stones serve as a reminder that you have the power to find consistent calm. The stones are sourced from around the world and grouped to emphasize serenity: Blue Lace Agate is thought to have stabilizing, trust-promoting dimensions; Rose Quartz is associated with love and an open, forgiving heart; Amazonite is a symbol of soothing well-being and conflict resolution. The trio is accompanied by an affirmation card with the message, "With every breath, I release the anxiety within and become more and more calm." 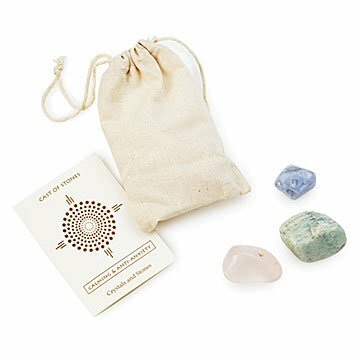 Carry them in their cotton drawstring bag as to inspire everyday inner peace, or add them to your decor for an earth-centered touch. Packaged in Los Angeles. Includes an informational card and a 100% cotton muslin drawstring pouch. Please note that crystals and stones are not meant to replace conventional medicine. It is not to be used as a prescription, diagnosis or treatment. The information given is purely metaphysical in nature and is by no means medicinal. For medical advice, please consult a licensed healthcare specialist. I keep these in a bag that I take to work every day. If I'm feeling anxious, I'll rub the stones in my hand or stick them in my pocket. Though there is no quick fix for anxiety, these stones help me focus my attention elsewhere during stressful situations. A friend of mine with anxiety and a love for crystals seemed like the perfect fit for this gift. They may not come with magic but they do come with the ability to remind her she can focus on them and work to ground herself again. I love that they come with an affirmation message and so did she. These may not work for everyone struggling with extreme anxiety and they aren't a magic cure for her, but they help and she enjoys looking at them, keeping them close, and using them when she feels she needs them. I would buy this again because my mom loved it! This product is great because it's a small gift but really worth it. I always carry this product around with me, in my car or in my pocket, whenever I get nervous I just rub them and somehow it calms me down. Maybe just because my mind is on the stone and not on whatever I'm worried about. I like them a lot and will continue to use.